See GURPS Low-Tech Companion 1: Philosophers and Kings for information on the social tools that made the pre-modern tools possible, including additional information on medicine, mathematics, and music. 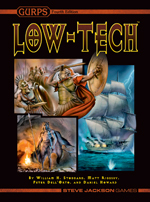 GURPS Low-Tech Companion 2: Weapons and Warriors has additional rules and information on low-tech arms and armor, plus guidelines for TL0-4 fortresses and military transportation. Pre-calculated piecemeal armor options make any gamer's life easier. 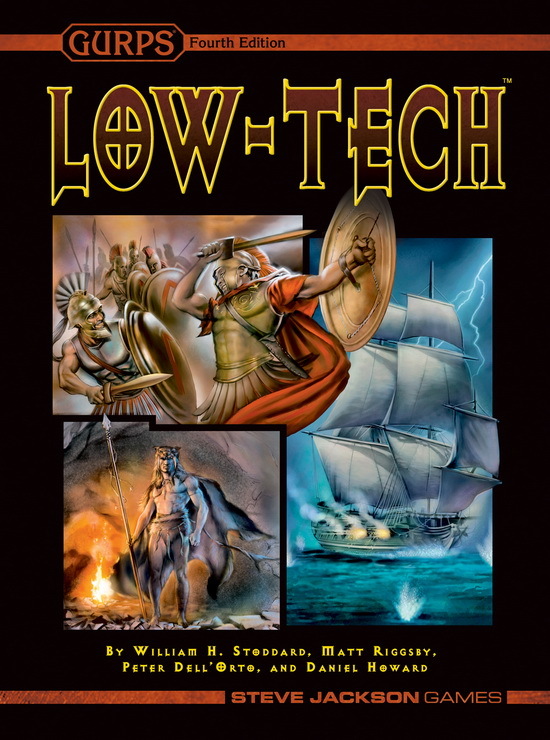 Get GURPS Low-Tech: Instant Armor and fight faster! For ready-made protective garb from a variety of historical eras, get properly outfitted with GURPS Loadouts: Low-Tech Armor. The GURPS Fantasy-Tech line features innovations that might have been feasible, creations that never caught on, far-fetched and crazy weapons, and other impossible possibilities. Expand your possibilities of jungle adventures, low-tech transportation costs, and more, with Pyramid #3/95: Overland Adventures. For additional rules, equipment, and insight – including articles written by the authors of the Low-Tech series – check out Pyramid #3/33: Low-Tech, Pyramid #3/52: Low-Tech II, and Pyramid #3/87: Low-Tech III.